Lately, it seems there are more and more severe storms intruding our great country. Perhaps it is just better news reporting, or maybe the Global Warming theorists have a point. 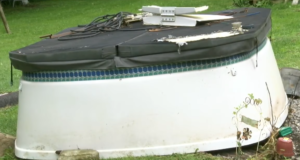 In any case, when disaster strikes, the hot tub is not usually the first thing that comes to mind. 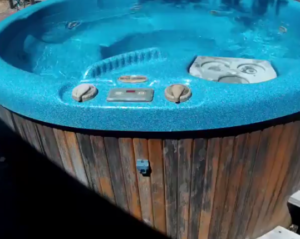 But as we rebuild and get our lives back to normal, the pool and spa areas will also need to be addressed, inspected and cleared for safe use. This is not only for hurricane damage but any severe storm that dumps a deluge of water and may cause brief flooding. Hopefully, the breaker and power was already shut off before the storm came in. This also to protect surges of power to the circuit board and other spa electronics. If there are signs of flooding of the cabinet, or just to be safe – check the spa for obvious signs of damage and accumulated water before turning it back on. If there is water or even excessive moisture in the equipment area, it is best to let it dry out before trying to turn the spa back on. If the pumps or spa pack has been under water, chances are they may not be able to be used again and new ones would be required. Most pumps are not of the IPX5 or other watertight standard and those pump motors are not meant to be underwater, even for brief periods of time. Spa covers can blow away in extreme wind and possible crash into windows to cause even more damage (that actually happened to me). When replacing a spa cover, monitor it for heaviness which can be a sign that the interior vapor barrier has been damage/breached and that the core is becoming waterlogged which can lead to mold and a very heavy cover. The cover will then need to be replaced. Blessings and all the best to anyone affected by storm damage. Sometimes it is a long road to recovery, but we have to take it day by day and try to keep a positive outlook.